We’ve been browsing the classifieds section to bring you a selection of the most curious cars on sale at the moment, whether they be ultra low-mileage classics or rare modern machines. Whether you’d want to buy them or not is a different matter, but that’s up to you. You’ve heard people explain that Kia is ‘a brand on the up,’ that it’s ‘going from strength to strength’ and other assorted clichés, but they’re all accurate. Kia really has come a long, long way, and that’s evidenced by this car. Just eleven years ago Kia was selling the Pride, an extremely dull car that did nothing exceptional. Even so, it was enough to win some fans in the UK, otherwise the brand wouldn’t be where it is today. If you want a taste of that nostalgia then for £895 you’ll get this blue example, a fairly distinctive colour for such a non-descript car. If you’re in the market for a Mustang then you’re already in a fairly niche marketplace. Even in entry-level form power comes from a 4.0-litre V6, which is hardly what you’d call a frugal. Such petrol-drinking machinery is far more suited to the US market, and as such the majority of Mustangs are left-hand drive. This one isn’t though, which makes it all the more unusual. It’s a 2007 model, with the smaller 4.0-litre engine, and it could be on your drive for £14,995. On the other hand - no pun intended - there’re cars like the Fiat Barchetta, which was sold in England officially and yet was never produced in right hand drive form. That means it’s in a high insurance group, and it’s part of the reason so few were sold. Under the skin it’s a mk1 Fiat Punto, albeit modified to improve handling. Power comes from a 1.8-litre 16v engine, so it’s sprightly if not breathtakingly fast. Still, it’s a pretty car, despite its flaws. 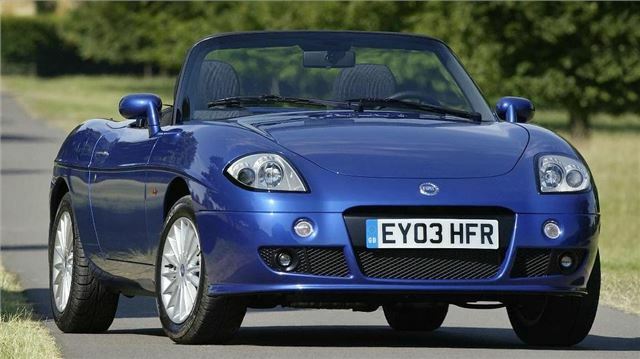 A little pricey, though – this 2005 model is for sale at just short of £6,000. Imagine buying a car tomorrow, driving it home and never bothering to take it out of the garage again for 43 years? Someone did it with this Triumph Herald in 1968. The result is a gloriously preserved car that looks like it was built yesterday. It's got an exceptionally low 92 miles on the clock and is priced at £19,995. But would you want to drive it or preserve it in a museum? Whether you’re looking to buy an oddity or a regular five door hatch, you’ll probably find what you’re looking for in the classifieds section.